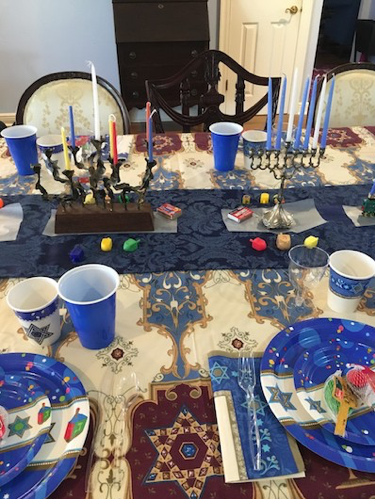 This year, as we do every year, we had a Hanukkah celebration at our home. Due to privacy concerns we cannot include photos of those who joined us. We can report, however, that we had Jewish guests who had never joined us before as well as others who recently embraced Yeshua as their Messiah. A wonderful time was had by all. The past few months have been amazing. G-d is at work here in New Orleans and in California, and I am so thankful He has allowed me to be a part of what He is doing. This past spring, I received a message from an Israeli woman who had recently moved to this area. Her husband saw an announcement about our monthly women’s meetings in New Orleans and encouraged her to contact us. What I did not know at that time was that her husband was a born again Christian who had been praying for his wife’s spiritual condition. While overseas, she met a Christian woman who was a living witness of the love of G-d shed abroad through Jesus. Due to the love and acceptance she experienced through this woman, she was open to getting in touch with someone else who was a disciple of Yeshua. Although her husband was a believer and this other woman was a believer, the wife had never met a Jewish believer in the Messiah. It was wonderful to hear from her and we set up a time to meet. Over coffee, I learned about her family and where she was spiritually. After our first meeting, she agreed to meet again. 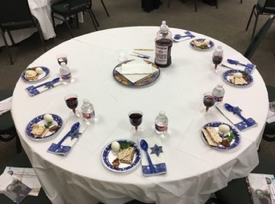 If I recall correctly, we met a couple of more times and she and her husband and daughter joined us for their first Messianic Jewish Sephardic Seder for Rosh Hashanah. And then disaster struck. Their daughter was not acting like she normally did and over the space of a week became increasingly lethargic. They brought her to the hospital, and she was placed in the pediatric ICU. Eventually, she went into a coma. I visited with the family in the hospital and many of their friends visited them as well. A number of months later, this mom told me that while she was in the hospital watching over her daughter, she prayed to G-d for the first time and begged Him to heal her child. 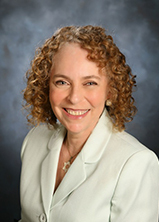 She is from a secular Israeli Jewish family and had never really given much thought to G-d when she was young. That night she confessed for the first time that she knew He was real and asked Him to come into her heart. Immediately she felt a presence in the room with her. Then she asked Yeshua to heal her daughter. The next morning her daughter awoke from the coma and she has been making a steady recovery ever since. Mom is now a disciple of Messiah. Since then, she and her family have celebrated Sukkot and Hanukkah with us, and we have met a number of times for discipleship sessions. She recently asked to be immersed. Immersion (baptism) for a Jewish believer is a huge step because once a Jewish person is immersed, they are no longer considered to be Jewish by rabbinic authorities or by the State of Israel. Since she is already an Israeli citizen, it is not much of a concern for her, but for those of us who are Jewish and disciples of Yeshua, it means we will be turned down if we ever apply for Israeli citizenship. That may not have much significance for you, but consider this: Jewish persons in Europe who became disciples of Jesus were considered to be Jewish by the Third Reich and were sent to concentration camps along with other Jewish persons. They suffered for their faith along with the rest of the Jewish community. If and when anti-Semitism gets so bad in the United States that Jewish people will need to seek asylum in Israel, those of us who are believers in Jesus will not have a place of escape. As the daughter and granddaughter of German Jewish Holocaust survivors, that is of great concern to me. I hope you will join me in prayer for the Ministry of the Interior in Israel, that the religious authorities would grant Israeli citizenship to Messianic Jewish believers. The most important meeting we hold every year is coming up on Sunday, April 7 from 4:30-6:30 p.m. PLEASE READ THE ENCLOSED FLYER WHICH HAS ALL OF THE DETAILS ABOUT THIS EVENT! We hope you will register early and come with friends and family! This event is appropriate for children in the third grade and higher, for teenagers, young adults, parents, and senior citizens. You can register on our web page at cjfm.org/michelleb. The family of a Jewish believer who recently passed away. Pray for her family, for G-d to comfort them with His peace. For the soon immersion of new Jewish believers. For a couple with whom I have been studying the Scriptures. Pray their spiritual eyes will be opened. For a number of Jewish/Gentile couples who are living together and are not married. Pray they would make a decision to live lives of holiness for G-d.
For our annual Mardi Gras outreach, that G-d would lead us to people who are open to hear about His love and sacrifice for us. Pray that G-d will provide the finances needed to support this ministry and the ministry of CJFM around the world. As the Lord leads, please use the enclosed envelope to send a supporting gift preferenced for Michelle Beadle. Your contribution entitles you to receive a subscription to our publication, Messianic Perspectives. P.S. I recently started sending out a monthly ministry update. If you are supporting this ministry with regular monthly offerings, I want to be sure you receive a monthly update by e-mail. If I do not already have your cell phone number and e-mail address, please text them to me at 210-410-1034, or e-mail them to me at michelleb@cjfm.org so I can keep in touch with you. Thank you so much for your support!